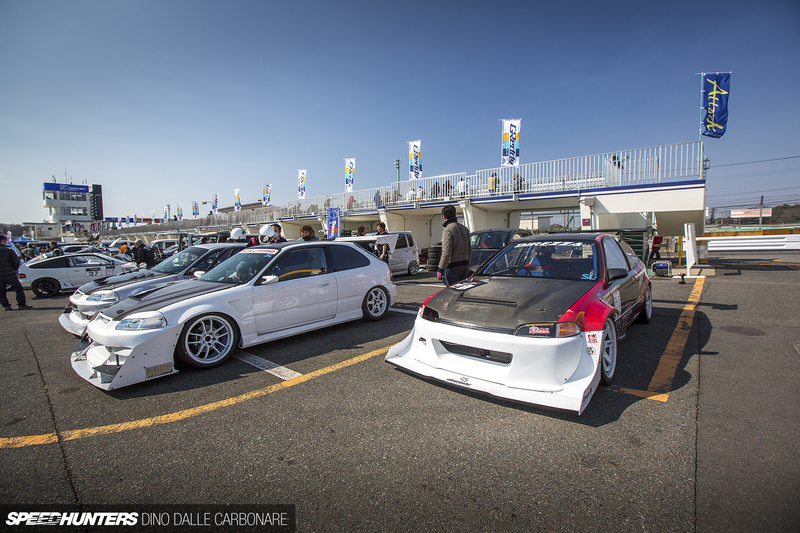 Did you think the Japanese time attack season was over for this year with the last Battle Evome event we checked out a few weeks ago? I did, until I heard that the Attack series was holding a pretty big gathering at the end of last month – something I couldn’t pass up. Now, I have to apologise for the slight delay in getting this coverage through, but following the event my better half delivered our latest double-addition to the family; so to say that I’ve been a little busy over the last week would be putting it lightly. Since the Attack meet I’ve spent some time going over the pictures I snapped during the unexpectedly warm February morning at Tsukuba, and following this initial event overview you can expect some more detailed looks at the coolest cars I came across. As far as size goes, Attack is a bigger event than Battle Evome. It brings out many more cars, including demo machines from both well known and lesser known tuner shops, but despite being larger, it still boasts an almost family-like atmosphere about it. I’d been meaning to check it out since it popped up on the calendar a couple of years ago, but other events and shoots always managed to keep me away. Not this time though! 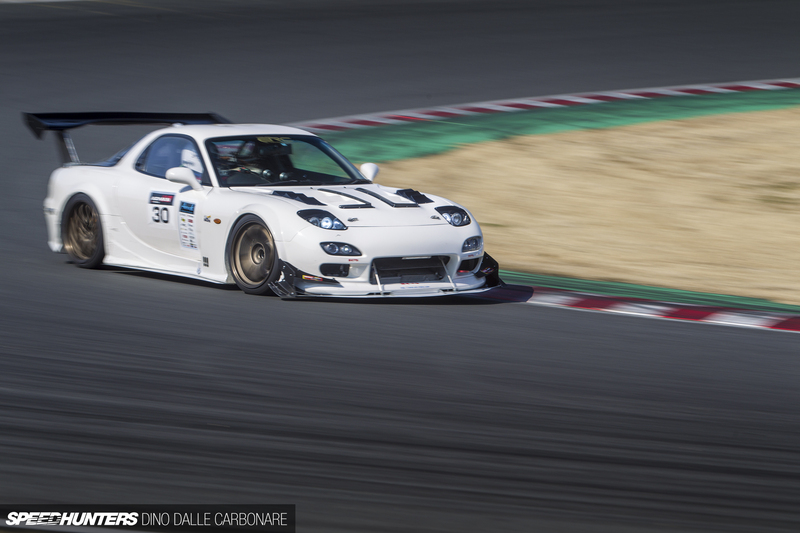 And boy am I glad I made the drive up to Tsukuba, because this is yet another cool event for circuit crazy people to get out there and attempt to better their personal best lap times at. With the winter season quickly coming to an end, these really are the last couple of weeks for time attack cars to achieve their short-term goals before the warmer weather moves in. Attack doesn’t only focus on Tsukuba; they’ve held events at Suzuka and Sugo too, really pushing competitors to develop unique setups for the very different tracks. Tsukuba however, is probably the toughest, because it’s not just about power and top speed, but a very fine balance between outright pace, grip and aerodynamics. There were some familiar cars running the 2.045km track too, like the Wood Village S30 pictured above. I can’t believe it’s been six years since I first spotlighted this cool creation. Remember the Kyushu Danji BNR34? It was also cool to see how far this car has been developed over the past couple of years. Since the last time I saw it, the GT-R has sprouted a Voltex-developed under-floor and pretty wild carbon running boards. The guys from Tomiyoshi Racing also brought out this sanyon beast, which had this really cool raw vibe about it, thanks mostly to the unpainted carbon fiber Sunline Auto fenders. Under the bonnet sits an 800PS RB26. As I took a quick look around the pits prior to the event kicking off, I noticed that the Endless team had brought along their FD3S project. 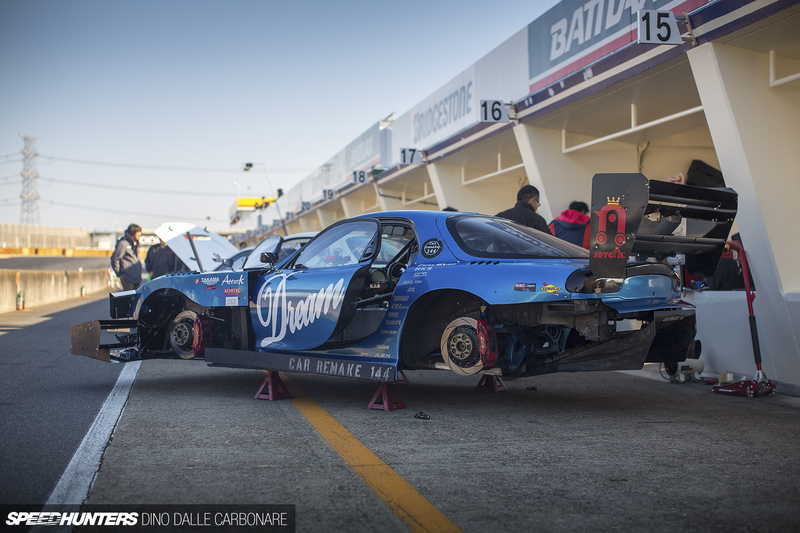 The R-Magic kitted RX-7 managed to set a 55″095 lap later on in the morning – one of the top times of the day. Esprit were also present with their 57-second Supra, which has evolved a huge amount in the aero department since the last time I saw it a few years ago. If there’s a time attack event happening at Tsukuba, you can bet that the guys from Garage Work are going to be out there with their purpose-built Civics. These hard-tuned Hondas exemplify the extremes some people go to in prepping their cars when horsepower is not the main ingredient. 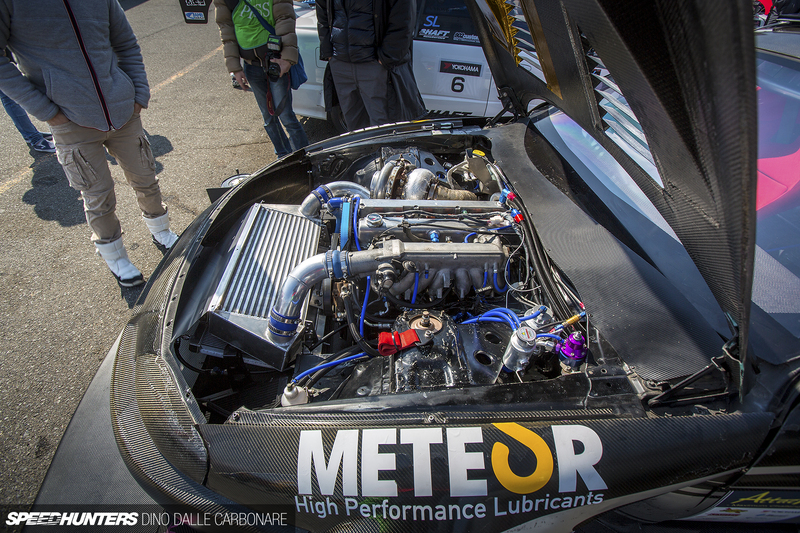 This 750kg EK4 SiR was the fastest car in the NA class managing a 57.580″ lap. That, my friends, is insane! Honda fans were spoilt for choice at this event, and I’ve got a spotlight coming up on one of my favourite finds, so keep your eyes peeled for that. There were other cars running in the NA ranks too, including this 996 from T-Tec. Check out the exhaust setup sticking out of the cut-out rear bumper – it sounded glorious at full chat down the straight! Car Shop Dream’s FD3S looks more like a GT300 RX-7 than the street car it’s actually based on, such is the aero development that’s gone into it. The 58-second machine sports one of the more intricate canard setups I’ve ever come across this side of WTAC. I’m guessing there’s no understeer issues here! As is the case for events like the Rev Speed Super Battle, the faster guys were all concentrated on the left side of the paddock. There was some serious variety too, and even a few cars I’d never seen before. Creations like this BNR32 all the way from Grand Slam Option in Sendai. I loved the simplicity of this Skyline, and it kind of reminded me of the first few stages that the ATTKD R32 went through back in the day before things started getting really serious. The fastest car on the day was the Kyushu Danji NSX built by Tomiyoshi Racing. It’s evolved a lot since we last saw it on Speedhunters, and not just in the aero department; it’s gone turbocharged to fully realise its potential. 54″101 is no small feat, and as you will see in the spotlight I have coming on the car, there’s plenty more speed left in the package too. This Garage Kagotani-built GDB Subaru Impreza WRX STI managed to better its previous best 57″470 by running 57″251. Looking at the substantial upgrades that have gone on in this engine bay, I think it’s about time I pay Kagotani-san a visit. We’ve featured plenty of his cars before, but I’m sure you’d like to see where exactly they get built, right? 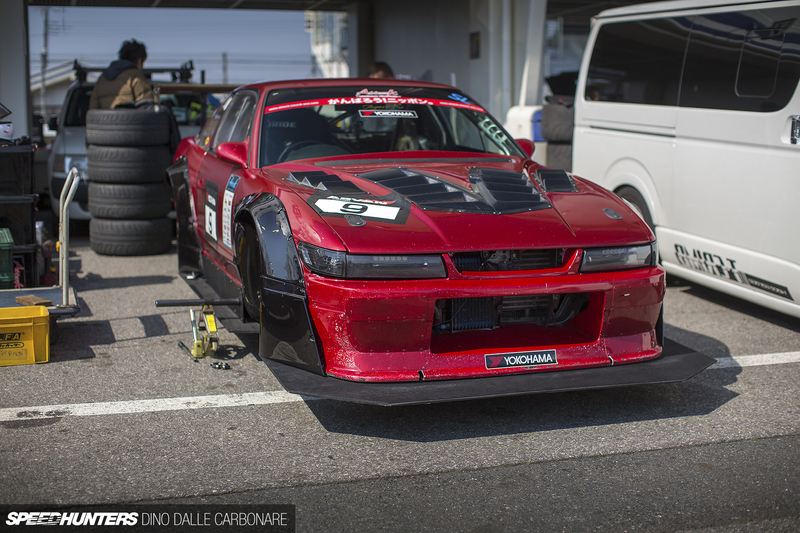 Isn’t it refreshing to see a Nissan S13 built for time attack? 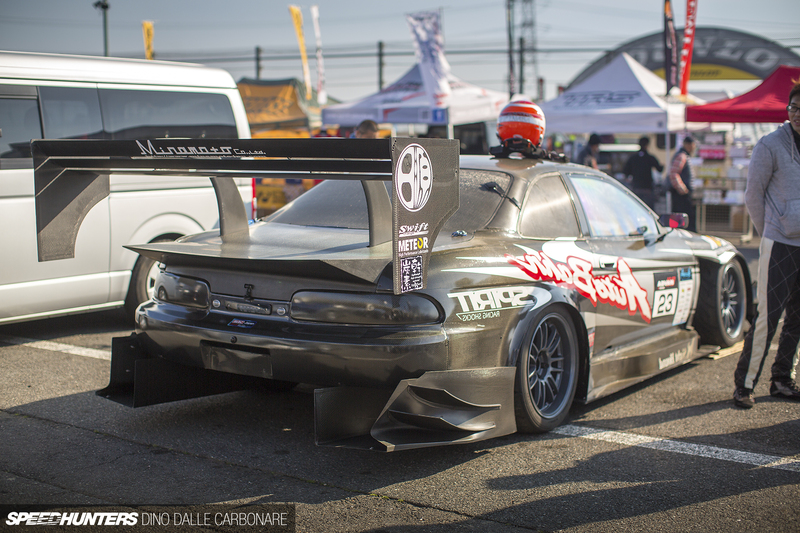 This Agent K-built Silvia comes all the way from Fukushima and has managed a fastest lap of 59″227. 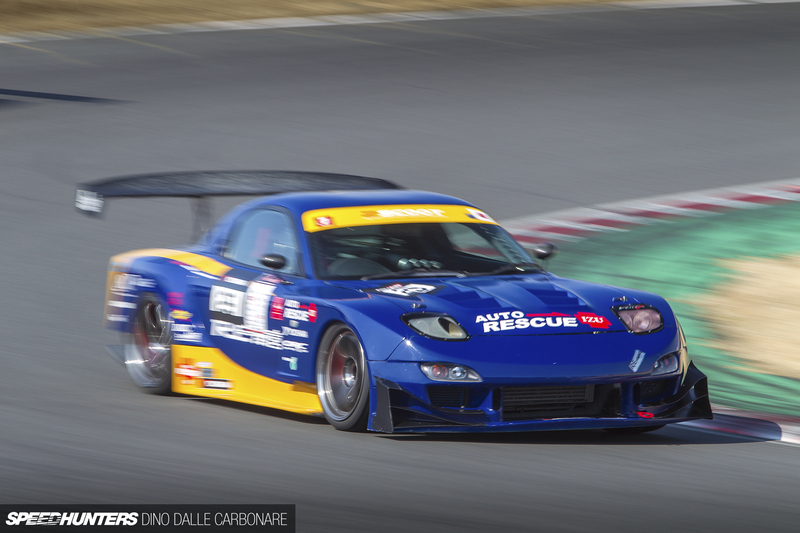 It wasn’t the only S-chassis chasing time at Tsukuba for Attack though; this crazy-looking S15 from Friends Racing was putting in constant mid-54-second laps. I really like the way it’s been built: super clean, almost minimalistic, but brutally effective. Check out how small the front air damn is; just big enough to feed the GReddy intercooler hiding behind it. On top of the couple I’ve shown you already, there were plenty more FD3S RX-7s to check out at the event. 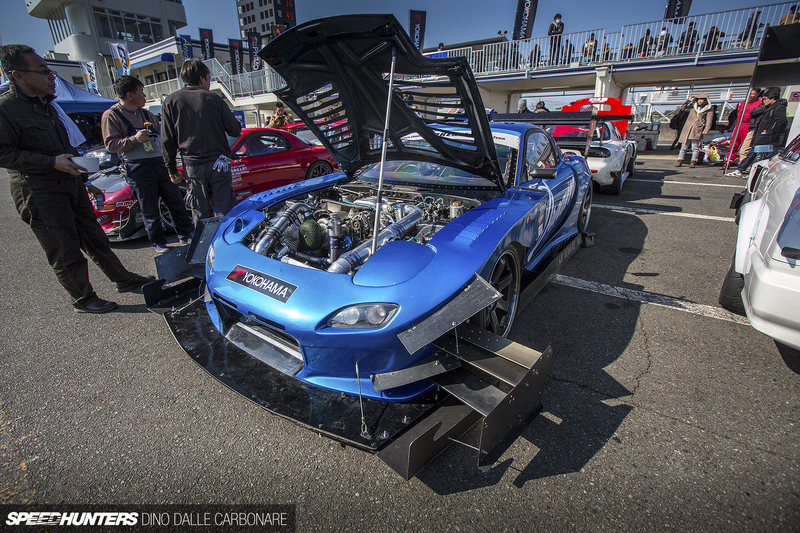 Years after it went out of production, the lightweight rotary chassis is still one of the most popular bases that people build dedicated time attack machines upon. 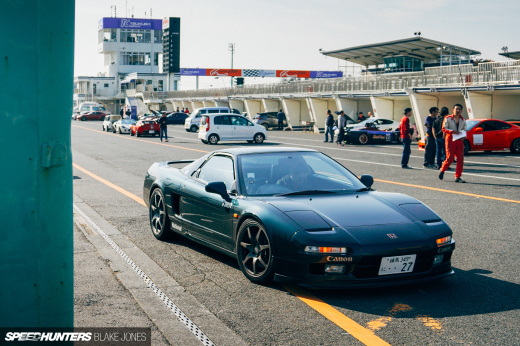 Remember Jun’s NSX I featured last year? In the time since he’s continued to evolve his stunning project with the help of Advance, and has been doing many more track days of late, hence the new aero additions. Before he went out on track he showed me his new LED DRL setup that shines through the closed headlights. Unfortunately, Jun wasn’t having the best of days, and after a couple of warm-up laps, he lost control of the Honda’s back end and put the car into the kitty litter on the last corner. The damage was mostly cosmetic, and he took it well, commenting that now is probably the right time to go a little crazier with the time attack look. It will be cool to see what he comes up with as he’s getting pretty handy with DIY carbon production. Another car that wasn’t having the best of days was the AutoBahn Z30 Soarer. Since we saw it at the Rev Speed event it’s managed a mid-55-second lap around Tsukuba, finally being able to make better use of the massive power and torque the engine develops. Before it let go… Ah well, I guess the rest of the year will be spent fixing things and taking it all to the next level. In a way, that’s the essence of this type of motorsport. I was actually pretty happy on this particular morning because my thirst for GT-Rs had been quenched. Aside from a few R32s and the R34s we’ve seen, there was even a more subtle street-registered R33 entered. 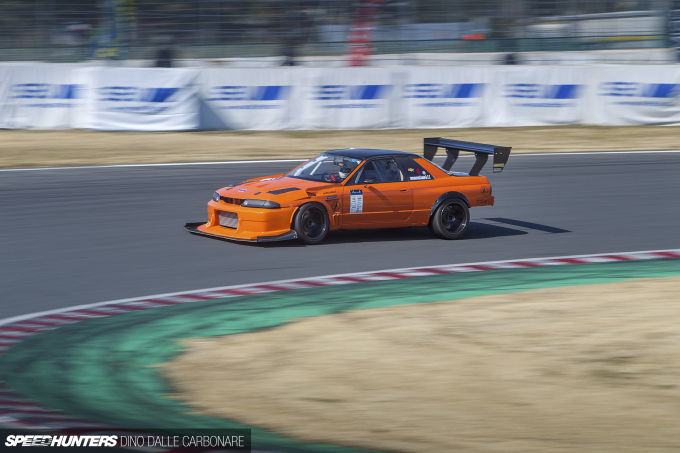 Hit play above to watch the short highlights video/trailer that Attack put together after the Tsukuba meet. They also created a DVD for those who want to check out the event in full. Hopefully this introductory post has given you a feel for what this event is all about. But it’s the cars in detail that I’m sure you’re hanging out to see, so I’ll get on with the spotlights. Make sure you check out what I’ve got coming! Is there any regulations there regarding how far can a spoiler stick over body? Is there any reasons we won't see 1-meter-wide aero in a couple of years? Any info on the Vette? I love seeing American cars in Japan. Anyone else notice the large "anti-dent" (whatever the opposite of a dent it) on the cover picture of the civic right under the headlight? Like a random bump on the body. 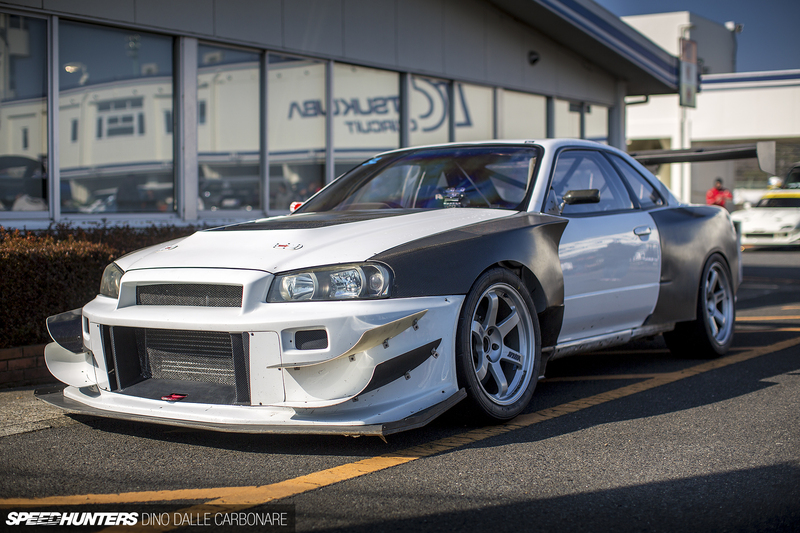 I thought you didn't like R33s Dino! Please post more pictures of the Garage Kagotani GDB. Congratulations Dino! I struggle with just my 3 month old baby girl; twins as well as your little boy (i think?) must be exhausting! Hopefully we won't see it because it looks awful, I think outside edge of the tyre should be a self imposed limit! First congratulations to your wife and to you. Blessings to your family. Dino I know this is off topic...but I recently jump on the 2JZ bandwagon & bough a Supra. Last year you make a article from a show and you took pics of a Pair of Supras from the same company that where featuring some serious time attack inspire aero parts. Can you please be so kind and post the link for that article or tell me the company or the shop who made them? I had look on the website but I can't find them. Thanks for the coverage Dino. What a great event, and all the hard hitters were there. Keep up the good coverage. Do the gtr's still have stock final drives. Or do they go 3.9 or 4.08? Just wondering bc the smaller track. JonathanW Its exhausting, but all fun in the end. Three boys in the house is gonna be interesting!! mayorquimby Good question, cars like the Mine's R34 always changed it out, will have to ask around next time. Ohhhh thanks Dino. I knew you will be of great help... from now on I will call you "The Man" but more like the way Denzel Washington says it. Lol! But can you tell me exactly who Kyushu Danji is? 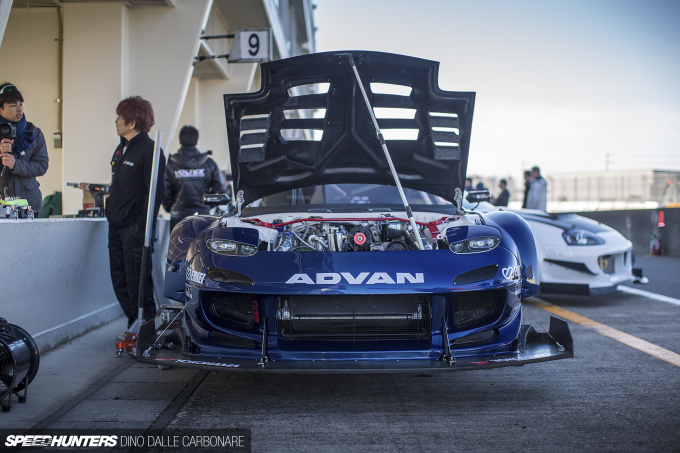 Are they a team or, as the name suggests, is it just some dude from Kyushu with the craziest collection of time attack cars anywhere? I'd love to see a feature on them/him! Obviously they have the NSX & the R34. But then they have a time attack Evo, S15, & RX7 too!! And I just wanna know - who the hell is Kyushu Danji?!?! 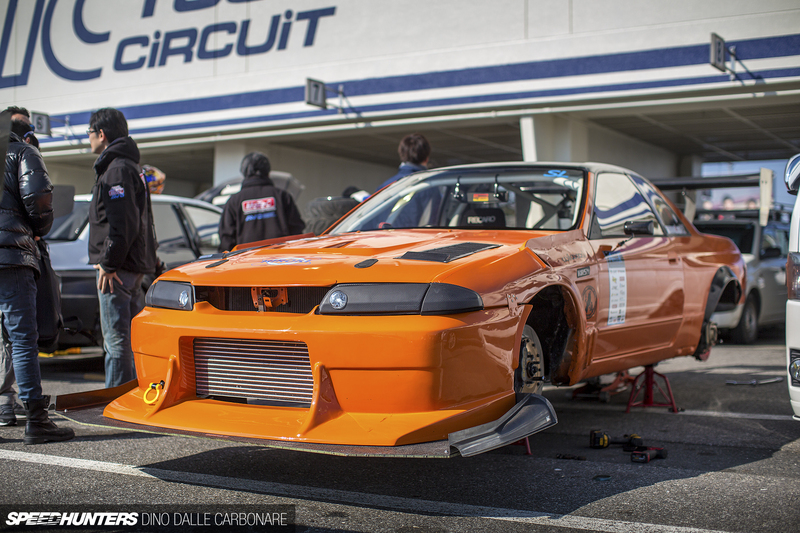 Notice how all the Japanese cars being run are like 20 years old. Japanese sports cars are dead. 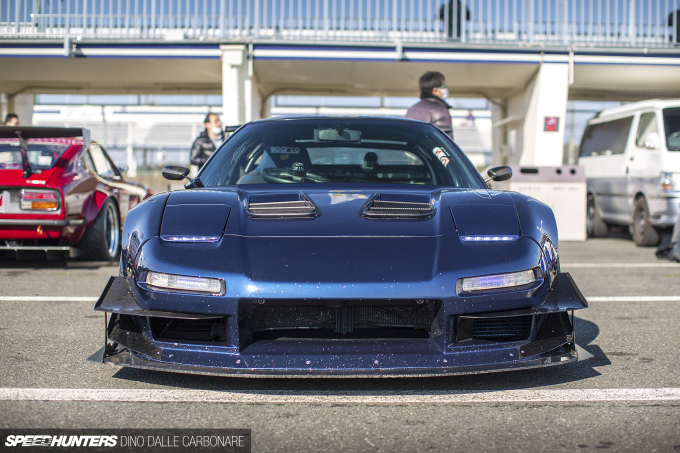 I'll be looking for a special feature on some FD3S"s and FC's please. No, it just means it is expensive to R&D new platforms. Why would the average person andor small shop spend a lot of money on a new car, and then spend much more money on developing it into a capable track car when they can get impressive results and also appeal to the average tuner / consumer for less money. let the giant tuning companies R&D the new stuff at their expense. in 20 years all the cars at these events will be the new cars now. it is a cycle. The only thing that needs to die off are people who make short sighted negative comments because they don't understand the process. raidensnakeezio Oh he was out there but had some issues so ran at the very end of the event when I'd already taken off. He didn't better his time, he was primarily doing some testing with the Motec guys. JayHundred It's a team, not just the NSX owner as there were a couple of other cars there (the 2 R34s) that were also Kyushu Danji and all built by Tomiyoshi Racing. No DC5? I thought it would be more popular among the Hondas: better chassis and engine! The more time attack coverage the merrier. Love that so many NA Hondas are so fast. All about that power to weight. Thanks Dino. I remember that spotlight you had on the Wood Village S30, it was at the top of the page on only my second visit to this site after having "discovered" it a few weeks earlier thanks to Mike Garrett's feature of the Lux Alfa-Romeo 159. To me back then this was the best car site in the world, period. Been coming back damn near everyday ever since....That there is good work, keep it up. Can we find out more about that super clean white R32 up there? It looks quite resplendent. 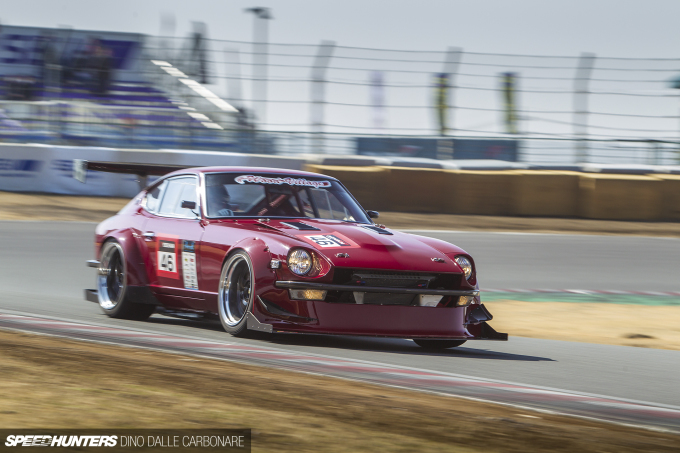 speedhunters_dino Mad4NA Absolutely love this type of coverage as well Dino, keep it up man, (also those sweet sweet wallpapers you keep feeding us). The more coverage and the more car features from these you can keep coming out way, the better! Love it! Friends-power.com and go to their blog. FunctionFirst Check out the yellow EG6 I spotlighted, online in a few days! mayorquimby I need to got there and feature all their cars and tour their shop! Been meaning to go for so long ! Any kei-cars racing in this event? Would be cool to see at least one. Best of luck, get them clicking shutters and turning spanners as soon as possible, keep them out of trouble!! Congratulations on the additions. I can't handle my 16 month old, I can't imagine two. That Z06 tho'. Would love a feature on it! These cars look so focused... Imagine driving one with those canards in traffic. They'll be clipped off before you know it!!! Must be trailered to the track, right? Agreed!! Time Attack, track days, club racing...can't get enough of it! Anything grassroots really. There are other avenues to find coverage of mainstream stuff, but the grassroots racing is what I really love about SH. Keep up the good work Dino! theAngryMarmot Smiggins And what exactly would the new cars be? speedhunters_dino Smiggins My statement was over the top but by and large its true. And it might be better if we all started facing the reality of things. Maybe one day the Japanese will start making sports cars like they were in the 90s but as of right now its just not happening. If they dont sell, theyre not going to make them. Which leads to something else that is better left unsaid. Nope, not butthurt at all. Just astounded by some people's shortsightedness and lack of understanding. speedhunters_dino Smiggins I disagree. We have a new Civic Type-R, and S660. We have the FRS/GT86/BRZs. Subaru is still making the STi and WRXs, Nissan hasn't stopped with the new Zs. Mazda has the new ND MX-5. I am sure I am missing various cars that are not available here in the states. Pretty good lineup considering what American or European manufacturers offer. In 10-20 years all the cars I listed will be as common as the cars in this article. Time + Depreciation + R&D = the cars in this article. oh gawd thanks Dino for showing the 7 lovers what they wanna see out there mate! @Shakedown14 Worse suspension design tho. Fantastic coverage as always! Was an amazing event, had a blast for sure. Does anyone happen to know the name of the manufacturer for the front bumper on that white FD RX-7 that is in motion between the red S15 Silvia and the blue NA1 NSX? I can't figure it out and it is driving me crazy, thanks in advance to anyone that has an idea.